Soft Peaks at 25 Alexander Street in Gastown. Soft Peaks makes all of their ice cream with organic Avalon milk and the cream flavour really stands out. The ice cream is super smooth and not as sweet as regular ice cream, resulting in a very refreshing and surprisingly light feeling dessert. The Honey Comb Peak comes topped with a piece of honey comb. I have never eaten an actual honey comb before, but it was delicious and added a good amount of sweetness to the ice cream. It also comes with corn flakes on the bottom, which added some crunchy texture. The Salty Himalayan was also really good because I love sweet and salty combinations. The maple sauce was great and not overwhelmingly strong like many maple flavoured things are. 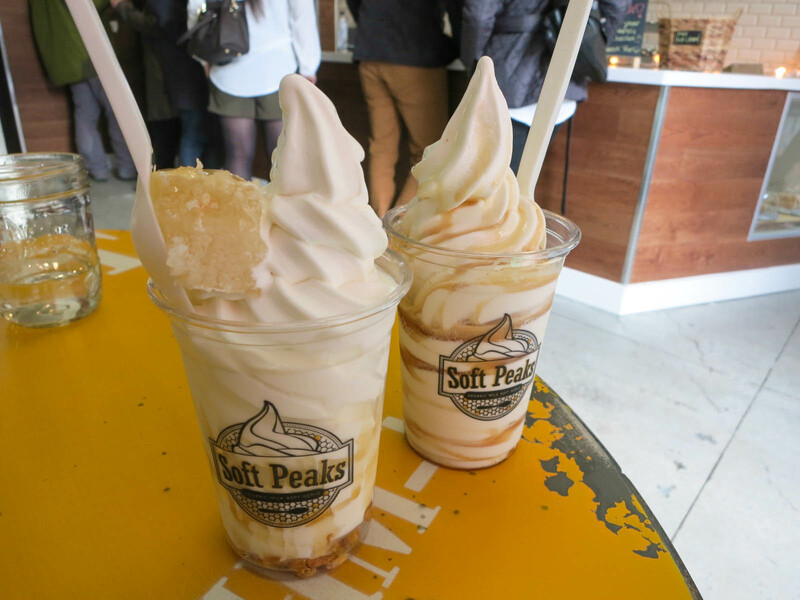 I loved the ice cream at Soft Peaks and would definitely return because soft serve ice cream is so much better than hard ice cream in my books. That looks absolutely amazing! I think that’s going to be my next target! Mmmmm! A destination when I come back!